“The Client”/“Performance Review” / "“The Client”/“Performance Review” "
“The Client” is a series-best episode of The Office whose series-best status sneaks up on you. It begins unassumingly, with Michael and Jan discussing a big meeting and the office workers talking worst first dates. The events that follow hew closely to classic setup-punchline rhythms—but unlike the groaners denoted and squirreled away in Michael’s desk, the turns “The Client” takes aren’t telegraphed from word one. What begins with a meeting that could save the branch ends as one of The Office’s defining half-hours, one that unearths new storytelling fodder and a subplot so crucial to the mythology of the series, it would form the basis of an entire episode near the end of Steve Carell’s time in Scranton. The continually impressive quality of “The Client” comes down to how well these early seasons of The Office built great episodes out of pivot points like Michael and Jan’s first kiss or Jim and Pam’s “first date.” Or maybe it’s the other way around: Was peak-period Office actually skilled at building those pivot points into its best episodes? I think it depends on what you end up taking away from the likes of “The Client” or “The Job,” highlights in the series’ overall arc whose individual stories feature highlights of their own. It comes down to the paradox that’s driven much of the debate around “quality” television, post-Sopranos: Does telling a complete, compelling multi-hour story matter if that story can’t also be appreciated on a chapter-by-chapter basis? It’s easy to over-estimate the amount of time devoted to the table read, which breezes by in a pair of scenes near the middle of “The Client.” In an episode where much of the action concerns two separate groups of people seated around tables, the energy rarely lags. In fact, those energy levels almost get “The Client” in trouble, powering the episode to a logical point of conclusion five minutes before the end credits. Chalk it up to the spirit of collaboration: The sense of fun that exudes from the conference room scenes, the moments of honest bonding (and evidence of real-life history) that radiate from Steve Carell’s conversations with Tim Meadows. For its ability to breathe life into moments that are little more than a filmed storytime, the cast of The Office deserves to be mentioned among the great TV ensembles of the past decade. 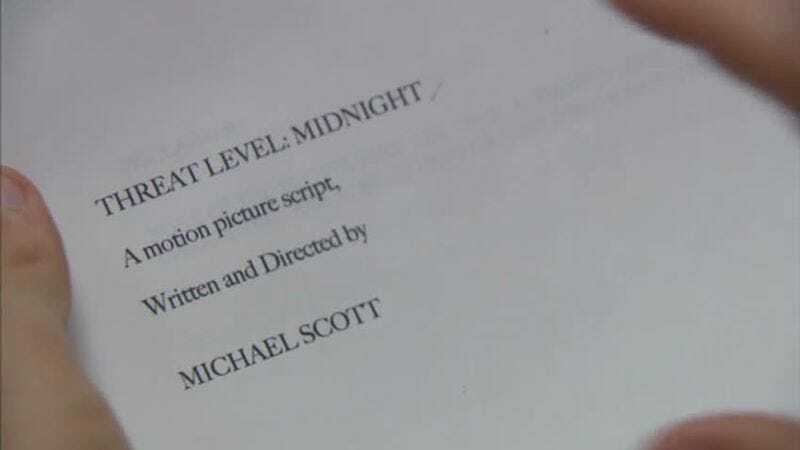 That sense of enthusiasm even infects “The Client”’s potentially extraneous final act, as Steve Carell climbs under Michael’s desk to keep Jan’s “Dear John” call off-camera—during which Greg Daniels made the wise decision to follow Carell with the camera, pinning the character into the uncomfortable position he’s made for himself. In a sense, “The Client” is the type of episode that’s so good, it’s frustrating—why can’t every episode of a TV show get its various components to work together as well as this one does? In addition to being a top-notch Office installment overall, “The Client” is a great Michael-Jan episodes, an installment that pits them in an entertaining tug of war without relying too heavily on the toxic chemistry that rocketed the couple to unfortunate heights of zaniness in later seasons. (“Dinner Party” notwithstanding, because it is wonderful.) This episode is where we get the first hints of Jan’s vulnerability, courtesy of a man who’s nothing but vulnerability. To be outdone by such a middle-management goofball as Michael would get Jan laughed out of New York City; that, more than the aftershocks of the character’s recent divorce, is carried across in the way Melora Hardin drops her defenses and retreats into second drink as the night carries on. But she has to be the Jan Levenson around the office, so the defenses are back up the next day, and the honest emotional connection she had with Michael must be written off as a fluke. It’s similar to the position “The Client” leaves its other will-they/won’t-they, ingeniously underlined by Michael and Jim’s episode-ending shared glance. Michael and Jan’s forbidden kiss makes “The Client” and “Performance Review” function as a unofficial two-parter, but this week’s episodes also feel like they should go together for the way they establish secrets, rumors, and interpretation as the currency of Dunder Mifflin. People around the office don’t forget much, and The Documentarians can fill in any gaps in that collective memory, so it’s easy to see why Pam blanches at Jim’s suggestion that Threat Level: Midnight, grilled cheese by citronella, Dwight’s fireworks, and a four-year-old Travis MP3 amount to the pair’s first date. It might not even be the details captured on film that send Pam backtracking—it could just be the words “some might say.” Michael and Jan’s relatively chaste rendezvous is blown out of proportion in “Performance Review,” so Pam—who has much more to lose in the grinding of the rumor mill—takes understandable action. It’s right for the show, and it’s right for the character, who might not remember the last time someone made dinner for her, but who also hasn’t come to a place where she can start thinking with her heart. But that’s putting the overarching story before the story at hand—keeping those priorities straight maintains the charms of “The Client,” eight years later. And, as we’ll see in the very next episode, it’s when priorities shift that The Office tended to stumble—even while it was still telling some great jokes. Maybe not “brown Probe” great, but still something that might make you shoot Awesome Blossom out your nose. As implied (and not, as Creed would have us know, inferred) above, “Performance Review” is more squarely invested in advancing the pieces on The Office’s game board—all the while keeping its gaze fixed on the events of the previous episode. It has its moments, but it’s also a difficult episode to fully invest in due to Michael’s single-minded fixation on finding closure (or what he deems to be closure) with Jan. The workplace McGuffin for the week is right there in the title: “Performance Review” takes place on the day when Michael would ordinarily visit bland platitudes upon his employees (probably a “fine work” for Stanley) and get them to dig “deep” with clichéd job-interview questions about hopes and dreams. This year’s reviews, however, have the unfortunate timing of playing out after Michael and Jan’s post-Chili’s makeout session, so the only reviewing going on in Michael’s office involves surgical analysis of a banal voicemail from Jan. Viewed from that angle, however, the entire episode amounts to a review of Michael, with the office taking petty cracks at his various odors and Jan offering an honest, unsparing appraisal of his qualifications as her romantic partner. There will be an echo of Jan’s departing declarations in season three’s “Back From Vacation,” but for now, Michael being the wrong guy for her is a reason to keep their relationship strictly professional. That’s an appropriate response, because the Michael on display and up for analysis in “Performance Review” shouldn’t be with anyone but himself. This is the side of the character that’s most difficult to watch, because he ignores all warning signs and plows ahead toward the only conclusion that will satisfy him: In this case, the conclusion where Jan addresses what happened after that meeting. It’s an abrasive and unattractive quality that’s nonetheless a part of Michael’s DNA, and it’s to Steve Carell’s credit that he wrings some laughs out of the hardheaded insistence. (One example: The look of satisfaction he affects when Jan lets him know looks have nothing to do with her decision.) But there’s always a moment in “Performance Review” where I want Michael to quit it, to swerve away from oncoming traffic and return to the same time and place as the characters surrounding him. That usually occurs right around the time his secret is blown wide open by the suggestion box, so there was at least some acknowledgment on the writers’ room’s part that dwelling so much on the events of “The Client” keeps “Performance Review” from utilizing its full potential. Michael isn’t the only person in the office whose obsessiveness unsticks him from time during this episode: Dwight is laser-focused on giving the best performance during his review, so much so that he’s living a full day ahead of his colleagues. 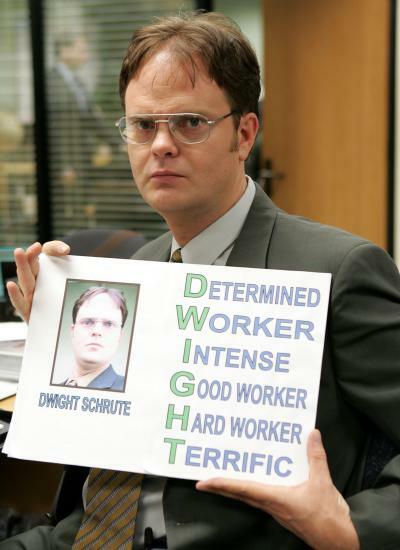 This is less a fulfillment of his wildest science-fiction fantasies and more an example of Dwight’s determination and intensity (which are what the “D” and “I” in “DWIGHT” stand for) turning against him—a weakness Jim can’t help but exploit. Dwight could also be distracted because he’s keeping his own secret. A portion of “Performance Review”’s table-setting is done very, very quietly through a pair of closeups—I’m not pointing out which ones, because I may have already said too much. The source of the direct quote escapes me, but I recall Paul Feig mentioning how comedy “lives in the closeup” around the time of Bridesmaid’s release. He applied that logic throughout his direction of “Performance Review,” an episode that never waits for a talking head to get right up in an actor’s face. Those choices dig deep into the voyeuristic aspects of the episode, which let the viewer eavesdrop on moments that would otherwise be confidential. 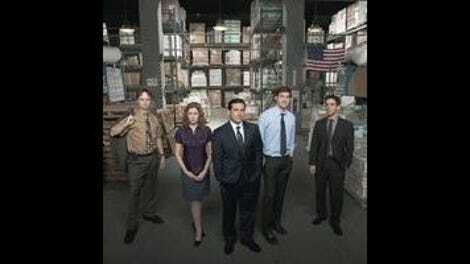 Add to that the whole office listening in to Jan and Michael’s exchange at the elevator, and no prior episode of The Office digs around in the characters’ dirty laundry like “Performance Review.” The episode sets up a portion of the season where secrets and snooping become recurring components—fitting for a show grounded in the truth-telling conventions of documentary film. If only those setup scenes were as fun as the prank interludes running alongside them. Great editing choice in “Performance Review”: Lingering on Steve Carell long enough for him to gulp down Michael’s true feelings at the end of the “This was mutual” talking head. In the world of the show, it’s early November in Pennsylvania—but in the real world, it was probably September or October in Southern California. As such, kudos to Melora Hardin for really selling Jan’s shivering smoke break. Hey, it’s 2005! : The post-OC reign of the music supervisor is in full swing during “The Client,” with Travis’ “Sing” bleeding out from Jim’s earbuds and into the sound mix, while The New Pornographer’s “Use It” (from the previous summer’s “The Client”-caliber LP, Twin Cinema) can be heard playing over the PA at Chili’s. Michael jumps to conclusions about Jan’s marital status (and never gives her ex-husband’s first name: “Jan, what happened? Is Gould dead?”).